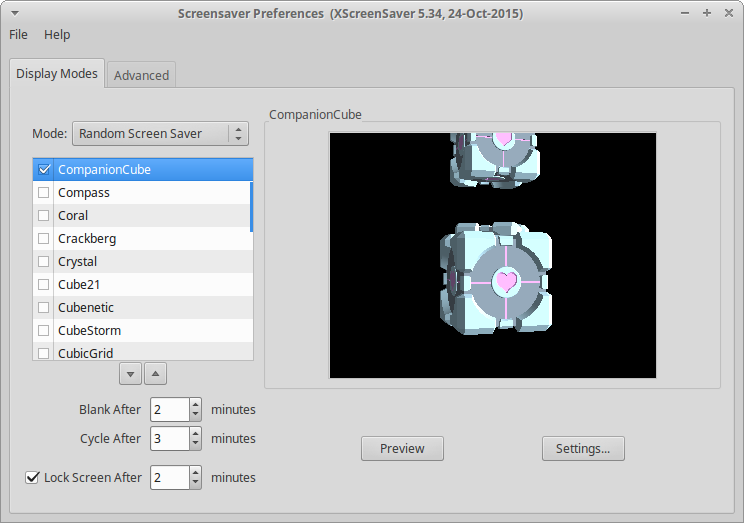 If so, this post describes how I installed XScreenSaver (and optional-but-essential add-ons like the CompanionCube screensaver) on Ubuntu 16.04. This script takes care of everything you need - just paste this into a shell script and run it, or paste each command one at a time. # Turn off Unity's built-in blanking. # * Setting "Turn screen off when inactive for" to "Never"
Once the install is complete, launch the xscreensaver-demo config util to pick the list of screensavers to run (among other settings). bill@foo:~$ cat /home/bill/.xscreensaver | grep "^  GL"